You've heard of Cookie Butter, right? Trader Joes sells it. It's also been called Speculoos, Biscoff or Karamelgebäck Creme. Well, that Cookie Butter is a knock-off of the creamy, caramel cookie spread made by The Lotus Bakery from Belgium! 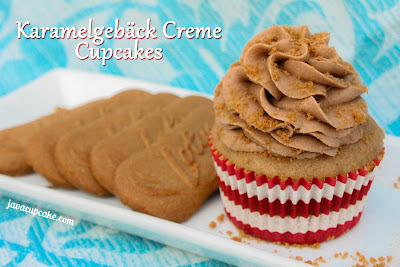 The Original Karamelgebäck Creme is a spread made from their popular Lotus Bakeries caramel cookie (often called a Biscoff cookie) that is commonly served in restaurants and hotels in Europe with coffee. It's similar to peanut butter or Nutella in it's uses, but the flavor is so distinct. I made a super delicious cupcake from the Original Karamelgebäck Creme and the Choco Speculoos that is like a Belgian explosion in my mouth! YUM! For the complete recipe, visit JavaCupcake!